Spacecraftcould soon take advantage of a sophisticated math algorithm that simulatesevolution to find the best paths to distant planets and comets. Engineersat the University of Missouri tweaked a mathematical approach called "differentialevolution" so that it works quickly and efficiently to plot the best coursefor robotic deep space missions. "Thishelps you figure out trajectory, size up the spacecraft, how much fuel is needed,what kind of launch vehicles are needed ? all answers you need to get beforegoing into the mission details," said Craig Kluever, aerospace engineer atthe University of Missouri. The math algorithmtreats possible solutions as individuals in a population, choosing a few eachtime to "mutate" and swap traits, then testing the mutants againstthe previous solutions. The best solutions win out and survive to the nextgeneration, where the process may repeat again and again. Applyingthis approach to calculating spacecraft trajectories is "not new, but it'scatching on," said Aaron Olds, a former MU gradstudent who worked with Kluever. The European Space Agency (ESA) sponsored twostudies that compared differential evolution with other methods — one studydeemed differential evolution the best, while the other study found itsperformance just average. Thiscontradiction in success arose because the ESA researchers used differentnumbers for population size, rate of mutation and the likelihood of traitscrossing over between solutions. Kluever and Olds set out to find the bestnumbers for calculating spacecraft trajectories. Theyfine-tuned the algorithm by testing it in a software program against four spacemission scenarios — including the complex 1997 Cassini missionto Saturn that involved swing-bys of Earth, Venus and Jupiter, as well as deepspace maneuvers. "TheCassini results were actually very close to what was actually flown,"noted Kluever. "A lot of event times and flybys were right on the same dayor just off by one day." Many of thebest solutions for Cassini did not precisely happen during the mission becauseof real world constraints. For instance, a planned course correction might havebeen delayed because mission control had problems communicating with theCassini spacecraft. Such realworld constraints will play a role in any real missions, but the differentialevolution algorithm simply ignores them. Kluever and Olds think the approachcan best help mission planners who design challenging future missions to distanttargets within the solar system. 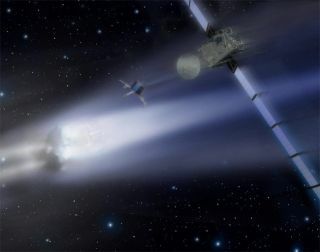 Oldspointed to recent ?missions that require a little more computational power,?such as the International Rosetta mission that will chase down a comet and puta lander on the surface by 2014. Rosetta?s complex trajectory has alreadyincluded twoswing-bys of Earth and one of Mars, with a final Earth swing-by planned in2009 before the spacecraft heads for its final destination. The differentialevolution approach could also apply to future missions such as a crewed missionto Mars, which Kluever and Olds used as a scenario to fine-tune thealgorithm. Mission planners currently use a variety oftools, including a ?design driven? approach where experienced analysts make a bestguess for spacecraft trajectories before making calculations, Olds said. He andKluever hope that space agencies will continue looking into differentialevolution. "Ithink it'd be nice if NASA would like to put it in their toolbox," saidKluever. "It's not going to be a replacement, but you can look at aproblem from a different angle."